EDITOR’S NOTE: A PP Blog story dated yesterday includes other details. Still pitching HYIP schemes and Ponzi-board “programs?” Positioning them as a means of helping a charity and/or ministry raise funds? 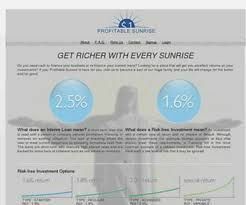 Becoming a promoter of Profitable Sunrise — an absurd Ponzi-board HYIP scheme with a purported payout of up to 2.7 percent a day plus “compounding” — may have long-term financial consequences on Nancy Jo Frazer of Bryan, Ohio. And the fallout is not limited to Frazer, a wife, mother, beauty-pageant champion and network-marketing enthusiast with a clientele that includes members of the faith community. Not counting legal bills from defense counsel, Frazer’s foray into Profitable Sunrise cost her, her husband David and Nancy’s Profitable Sunrise colleague Albert Rosebrock at least $108,146.61. That’s the sum due the Ohio Attorney General’s office as part of a supplemental settlement agreement finalized in recent days. The PP Blog obtained the supplemental settlement agreement through a public-records request with the state of Ohio yesterday. The document was received today, along with other settlement documents requested by the Blog. There was a slight delay in obtaining the material because sensitive information in the documents such as bank-account numbers had to be redacted before they could be sent. The supplemental settlement agreement shows that Profitable Sunrise may affect the two Frazers and Rosebrock for 10 years to come, given that the state has agreed to accept payments from them totaling a minimum of $844.02 a month for the next 120 months. The trio optionally may choose to pay a higher monthly sum to retire the debt faster. Slightly more than $6,864 of the $108,146.61 due has been satisfied through the application of previously frozen funds. The Frazers and Rosebrook, however, must begin paying down the balance within 60 days. The supplemental agreement has an enforceability provision that calls for the entire unpaid sum to become due in the event of a default and adds a fee of 10 percent if default occurs. Separate documents obtained by the Blog through a public-information request show that Ohio has used a second set of enforcement teeth to assure compliance with a separate agreed order. That agreed order provides the state the authority to bring a contempt proceeding before the Williams County Court if prosecutors come to believe Nancy Frazer and Rosebrock aren’t holding up their end of the agreed order. The agreed order specifies that financial sanctions against them could total $710,000 if a judge who conducts an evidentiary hearing at the request of the state holds them in contempt. If any of the Defendants fail to comply with any of the conditions as set forth in this Agreed Entry and Order, the State may file a Motion to show cause why Defendants should be held in contempt. In such case, the Court will conduct an evidentiary hearing on the State’s Motion. If the State demonstrates after an evidentiary hearing by a preponderance of the evidence that Defendants Nancy Jo Frazer, Albert Rosebrock, and/or Defendant Defining Vision Ministries, Inc., individually or in any combination, through their own actions or through the actions of their agents, representatives, or assigns, violated any of the conditions set forth in this Agreed Entry and Order, the Court shall order a judgment in an amount up to $710,000.00, in favor of the Attorney General. In any such action for contempt of Court, the State need not establish whether or not any damages were appropriately awardable under the claims set forth in the Complaint. The order also reveals that a freeze on a Rosebrock bank account in July 2013 resulted in a payment of $910.30 to him from Social Security being made inaccessible, a circumstance that demonstrates that unpleasant things can happen if investigators believe tainted funds are mixed with legitimate money. The Social Security funds have been released to Rosebrock. It clearly could have gone harder on Nancy Frazer et al, but it’s equally clear Ohio won on the enforcement front. The message: Pitching utterly preposterous HYIP schemes and presenting them as charitable fundraisers or endeavors simply will not be tolerated. There will be costly, potentially embarrassing litigation. There will be serious financial consequences (at least). Concluding note: For reasons of competitive journalism and security, the PP Blog is declining to publish the settlement documents. This is a story about a ribald HYIP fraud — Profitable Sunrise — that appears to have been operated through a mail drop in England by a person using the identity of a ghost. Even with the redactions, the Blog is concerned that HYIP scammers and dens of thieves could use certain information in the documents to start harm anew. The Blog therefore is choosing to err on the side of caution. Do either of the orders cover future conduct? In other words, are Nancy Jo and friends forbidden to promote HYIPs? Deana Holmes: Do either of the orders cover future conduct? In other words, are Nancy Jo and friends forbidden to promote HYIPs? d. Engaging in any deceptive, fraudulent, or manipulative act, practice, or transaction in connection with the sale of securities in violation of the Ohio Securities Act, R.C. 1707.01 through R.C. 1707.99 and the rules promulgated thereunder. “Defendants admit that they violated R.C. 1707 .44(A)(I), R.C. 1707.44(A}(2), R.C. 1707.44(C)(1), as alleged by the State in the Complaint. The admissions pertain to violations of Ohio securities statutes. It looks very much as though the state has covered the HYIP front. The Agreed Entry prohibits Frazer, Rosebrock and their charity from selling or offering to sell securities in or from Ohio and further prohibits them from acting as a securities dealer, securities salesperson, investment adviser or investment adviser representative without prior approval of the court and without proper licensure. I have spent the last two days trying to get over my disgust with this settlement and Nanci Jo’s “it was all just a big misunderstanding” behavior since. She still tries to paint it as though she was just a housewife trying to run a little ministry and got taken advantage of by an internet scammer, and with a straight face “in the OTHER 22 MLM opportunities that I have been in that all failed, I never got caught”. She brought her sizable downline along and bragged about how close she was to the insiders and familiar she was with the details of the program, when she had been stonewalled herself when she asked for proof. She continues to try to blame, of all people, the Office of the Ohio Attorney General because they knew it was a scam before they told her she was under investigation. I’m just disgusted by every word that comes out of that woman’s mouth or keyboard. Please please let me know the first time you see her whoring for some cheap ponzi so I can personally see if the State will allow her a second free pass at helping to steal tens of millions of dollars. I`m from Mauritius and I`ve also been a Victin of Profitable Sunrise Via Nancy Jo Frazer and I was even Arrested and Jaild bvexcause I was Promoting the Company and I did not even Knew it was a Ponzy Scheme I was FOOLED and even LOST ALL my Personal Money and Investigation is still going on here in Mauritius .Please keep me posted as to where the Investigation has reached there and also the Possibility of Recovering The Money I invested and that of my local Downline . Pastor Gabriel Helene: Please keep me posted as to where the Investigation has reached there and also the Possibility of Recovering The Money I invested and that of my local Downline . In the case filed nearly two years ago by the U.S. Securities and Exchange Commission (SEC), the SEC recently asked for entries of default against the original defendants or relief defendants. A relief defendant is a person or entity alleged to have received tainted funds. Nancy Jo Frazer is not on the SEC list because she was not named a defendant or relief defendant in the agency’s case. The case against her was brought by the Ohio Attorney General and the Ohio Division of Securities. As for the possibility of recovering your money, I’m not sure how that will proceed. Profitable Sunrise was exceptionally murky cross-border fraud scheme.